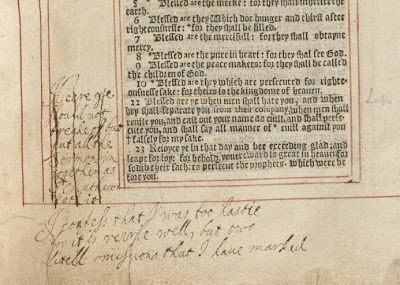 As was announced last week on the Houghton Library's blog, the Houghton's Little Gidding Harmony has been digitized. It was done with money I was granted by the Episcopal Women's History Project for the express purpose of producing a high-resolution electronic facsimile of this very special book. I'll be using these images in a digital project I'm working on about Little Gidding. That digital project will be part of my dissertation, which is on the Harmonies -- specifically, on the cut-and-paste construction of these books as a form of early modern female authorship. Broadly construed, my work situates the Harmonies within the ever-growing canon of early modern women's writing and media production, both text and textile. Given my interest in Little Gidding, and my occasional blogging about it, I have, since Houghton's announcement, received quite a few emails and tweets about the Harmonies. I'm delighted to see interest in these unique books, and decided to write up answers to a few frequent questions I get about them. Feel free to ask me any additional questions in the comments. Uhm.. what? These are "cut-up" books? Like, Burroughs? What does that mean? Right; I should probably start with the basics. Little Gidding was an Anglican community that flourished in Huntingdonshire in the 1630s and 1640s. 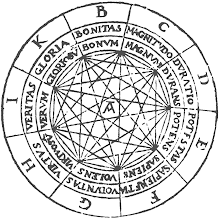 It was started by Mary Ferrar and her son Nicholas Ferrar. Nicholas was a former Member of Parliament and had been involved in the debacles of the Virginia Company during the 1620s. Disillusioned, he and his aging mother bought a dilapidated manor house in Huntingdonshire in 1625, where they, along with their extended family, lived a simple yet highly regimented life of prayer and devotion. Sometime toward the end of the 1620s, the family began making Gospel Harmonies. 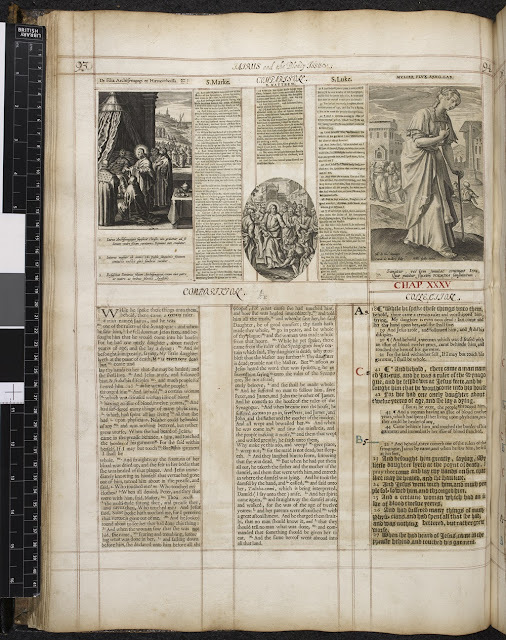 They did this by cutting apart the gospel accounts of Matthew, Mark, Luke and John in printed editions of the Bible, then pasting them back together into 150 chapters that tell the story of Christ's life in chronological sequence. In other words, they are remixing four separate accounts of the same events into a single linear narrative. Later Gospel Harmonies deal with the great variance found across these four books by using different typefaces and colored inks to construct multiple reading pathways through these 150 chapters; but the Houghton Harmony, which is the earliest known, does not. All the books cut their source texts at a level of great detail, chopping apart phrases, even words. Thus they were not remixing entire pages of text at Little Gidding, but small units of textual information. However, they remained fairly faithful to the verse sequencing that has structured English Bibles since the publication of the first Geneva Bible of 1560. -- others are highly complex collages of multiple figures carefully cut from their original context. 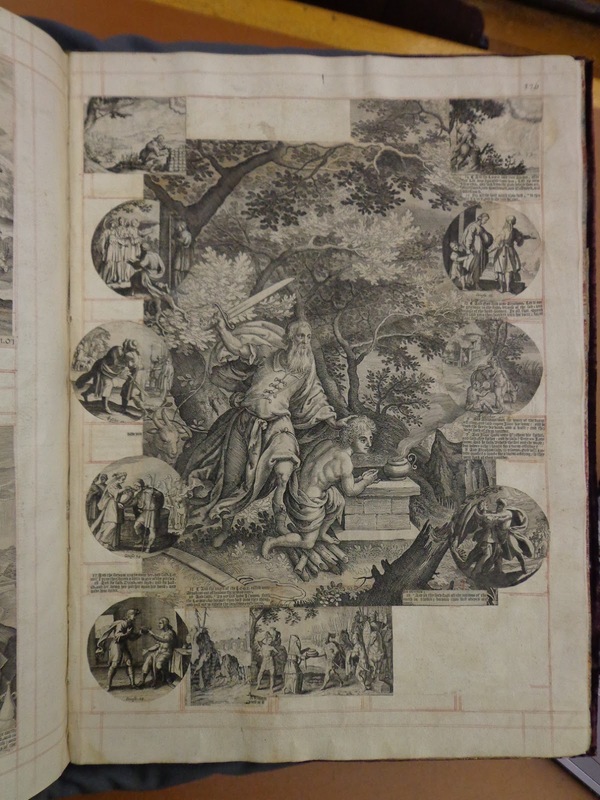 The book's actual title has been extracted, and a Christ figure has been added from another engraving. Two other figures beside Christ have been cut from their original context, with text pasted between them and where they "should" go in the uncut print. 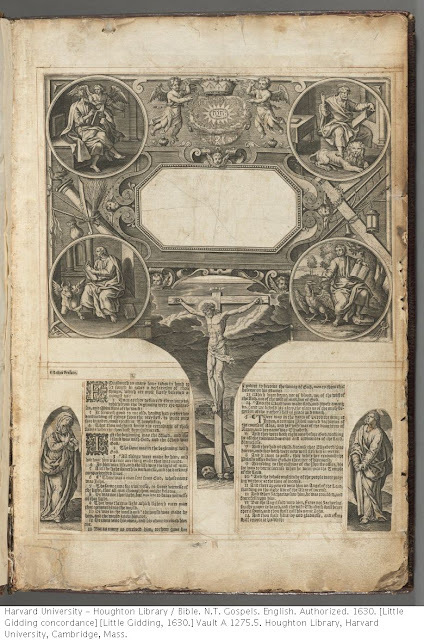 Though far simpler than later collages found in the Harmonies, this attentiveness to design and the general relationship between figures and their own symbolism shows that this volume was far from a simple book used for public readings. Rather, composing it was part of a broader devotional practice that enacted spiritual relationships through actions like cutting and pasting. In other words, the process of making these books, of adorning them, was as important as the product of the adorned book. Why did they make these strange books? There is of course a long tradition of harmonizing the gospels, or producing concordances of scripture. Joyce Ransome has recently argued that the Ferrars may have initially made their own cut-and-paste book with the goal of sending this "dummy" manuscript to a printer, to be typeset and published as just such a concordance; but they were pre-empted by the publication of Johan Hiud's The Storie of Stories (1632). Ransome's argument is tempting, and is backed up by evidence within Ferrar's correspondence. Regardless of whether the community wanted to publish their books in print form, though, the desire for a chronology of Christ's life, divided into 150 chapters, emerged from the community's reading practice. Passages from the New Testament were read aloud daily, with the goal of completing all four gospels over the cycle of one month. The entire psalter was also divided into chunks and read aloud daily, over the course of various set reading times. 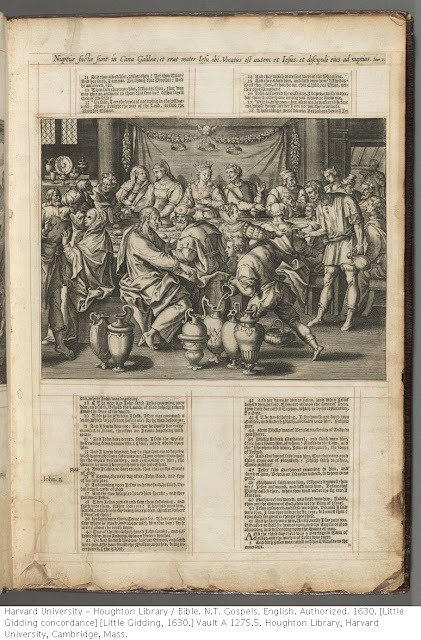 The Ferrars needed books that facilitated these communal reading practices -- books that were composed entirely from scripture (many other published harmonies were bloated with additional commentary), and ordered in a way that matched how they read together. In other words, they needed a kind of "Little Gidding edition" of a Common Prayer book. The Houghton Harmony fulfills this purpose. Later Harmonies get insanely complicated in how they structure reading in their design, and in the visuals they employ. As such, they become artifacts in their own right, somewhat independent from the context of the community and more oriented toward the demands of their royal patrons. Nonetheless, the practice of harmonizing seems (appropriately enough) to have emerged from this collaborative oral reading practice. The King's Harmony initiated a long relationship between Little Gidding and King Charles I. The community made many books for him, his son Charles, Archbishop Laud and possibly others associated with his court, even after Nicholas Ferrar's death in 1637. *Sidenote: a bit of a mystery is attached to Charles' annotations of the Houghton Harmony. Another volume, now at the Bodleian, also appears to have been annotated by Charles, although the curator has not provided me with independent confirmation. The presence of Charles' hand in the Bodleian volume disrupts the usual sequence of events linking Little Gidding to the court. C. Leslie Craig addressed this mystery many years ago in an article in the Harvard Library Bulletin, titled "The Earliest Little Gidding Concordance." How did you find out about these books!? Like "how long have you had your hair," this is one of those questions whose frequency confuses me! But, the answer is simple: Bill Sherman mentions the Little Gidding Harmonies in his excellent book, Used Books: Marking Renaissance Readers (2008), in a chapter on a manuscript Book of Common Prayer designed to look like a printed book. The citation stuck in my mind (as have many things about Sherman's work), and I've been researching Little Gidding more or less ever since. Who else is working on these books? 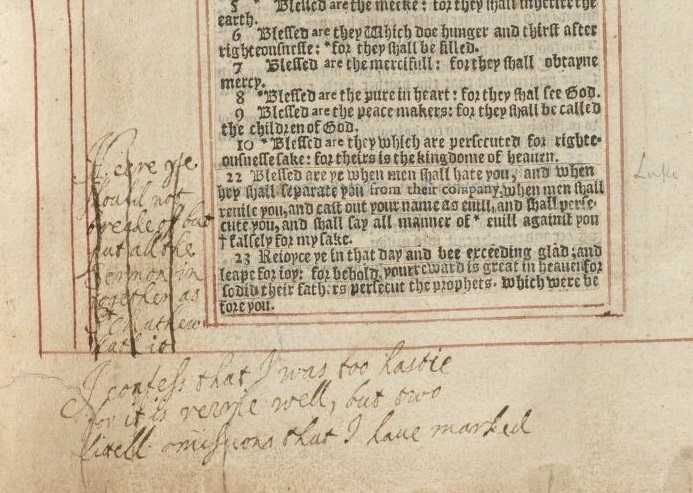 Adam Smyth has recently written an article in ELR on George Herbert and the Harmonies, and continues to work on the Harmonies as part of larger project on book destruction in the early modern period. 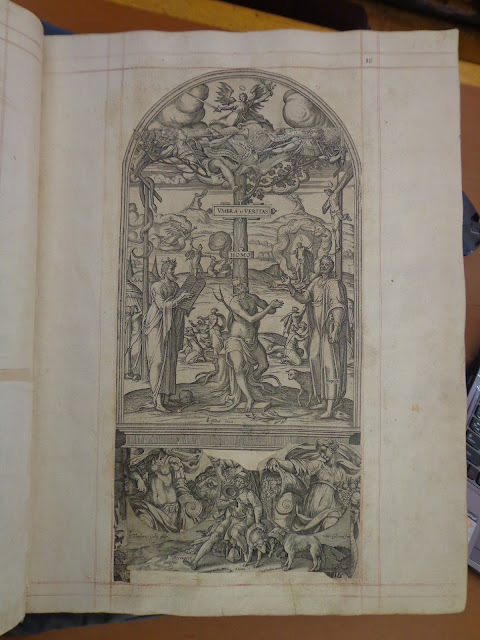 Paul Dyck has published an article on the King's Harmony in The Library and in the George Herbert Journal, as well as a series of excellent articles with his collaborators on turning the Harmony into a digital edition. Joyce Ransome's 2011 book on Little Gidding, The Web of Friendship: Nicholas Ferrar and Little Gidding, has a chapter on the Harmonies. She has also published an article on the Harmonies in The Seventeenth Century. Margaret Aston has a chapter on Foxe's Book of Martyrs and the Harmonies in Agent of Change: Print Culture Studies after Elizabeth L. Eisenstein (2007). While the Harmonies didn't attract much attention in the twentieth century, a few intrepid scholars wrote about them. George Henderson's "Bible Illustration in the Age of Laud" describes some of the source texts used in the Harmonies. Stanley Stewart has a chapter on the Harmonies and Herbert in his book George Herbert; I wish future Herbert scholars had read it more carefully. Earlier in the century, C. Leslie Craig and Nancy Cabot both published on the Houghton Harmony. Carmen Ortiz-Henley recently completed a dissertation on the Harmonies, and Michael Gaudio is writing a book on their use of religious prints. I haven't used many qualifying adjectives in the sentences above because these articles/chapters are all superb, and well worth reading. I'm sure I'm missing others. I have a lot more to say about all of this -- especially about the Harmonies as the products of women's labor -- but fear I am already way past TL;DR. Thanks to anyone who has ever shown an interest in these beautiful books. As Adam Smyth has said, "their time has come." You are like a Little Gidding resident. Your labors are fruitful. But of many generations - "